The G Flex was just the start - LG has just announced an 18-inch OLED panel that can be completely rolled up like a poster while still displaying images. The display, which has a resolution of 1200 x 810, can be rolled to a radius of 3cm without affecting the display functionality, says LG. It's not just a gimmick, either. 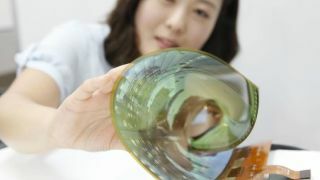 Flexible displays would be perfect for fitting a TV into those awkward places. As well as that, LG said it's also built a transparent OLED panel which boasts 30 per cent more transmission than existing displays and a haze level of 2 per cent - which basically means it looks nice and vivid. "We are confident that by 2017 we will successfully develop an Ultra HD flexible and transparent OLED panel of more than 60 inches, which will have trasnsmittance of more than 40 percent and a curvature radius of 100R, thereby leading the future display market," said In-Byung Kang, senior VP and head of the R&D Center at LG Display.